I'm kind of on a lamb kick these days. It took me awhile to learn to like lamb, but now it's one of my favorite things. So, naturally when I (and about 20 other gals) was asked to design a custom baby onesie for Brian's cousin's baby shower, my mysterious mind went straight to lamb -- specifically herb-crusted rack of lamb (so obvious, right? I know.). I have a tried and true, finger-licking good recipe that I love dearly. I printed it on an iron-on transfer, added some ribbon, sequins, and voila! 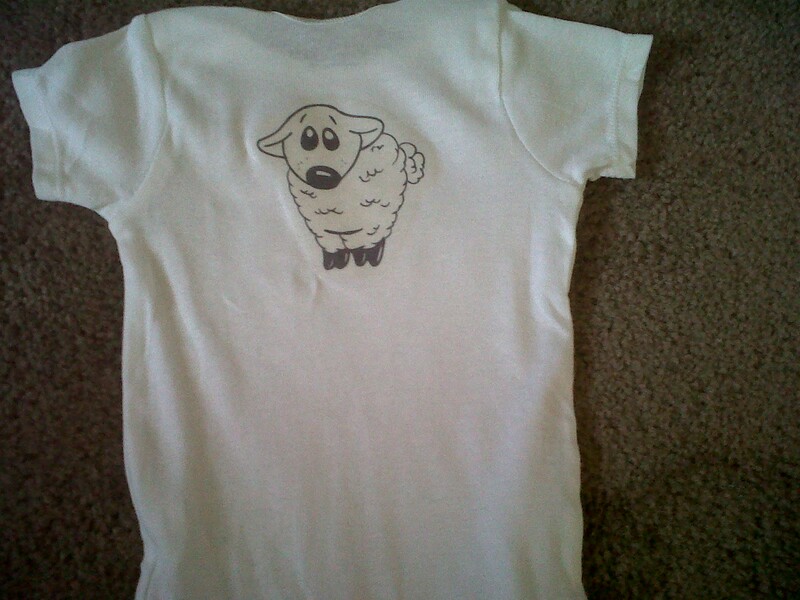 My fictional baby clothes line "Baby Food" was born. 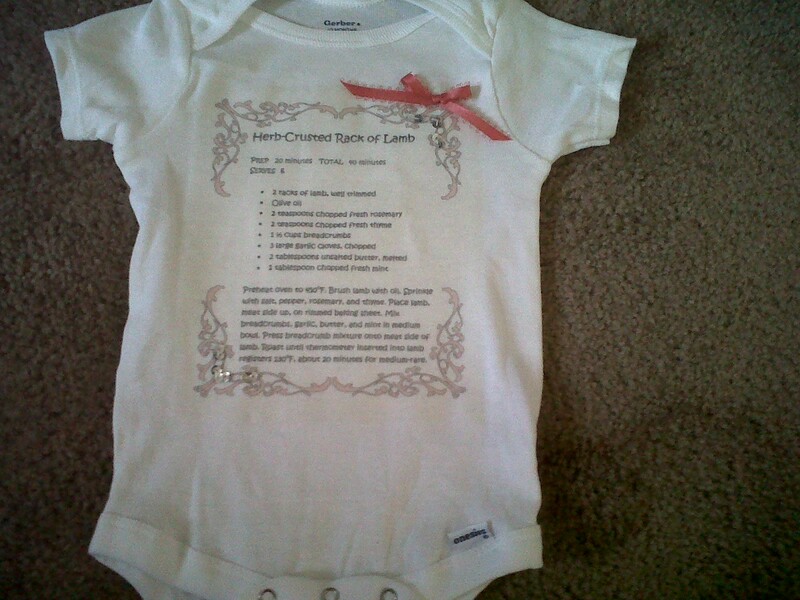 My mother-in-law thinks I could make a great living selling these recipe onesies in 5-packs (an appetizer, entree, two sides, and dessert). Not a bad idea! Preheat oven to 450oF. Brush lamb with oil. Sprinkle with salt, pepper, rosemary and thyme. Place lamb, meat side up, on rimmed baking sheet. Mix breadcrumbs, garlic, butter, and mint in medium bowl. Press breadcrumb mixture onto meat side of lamb. Roast until thermometer inserted into lamb registers 130oF, about 20 minutes for medium-rare. OMG, not going to lie, that is an amazing idea! The name is great, the concept is kind of cool, but I would also include a printed recipe card so that you don't have a onesie on the counter while you are cooking! Great idea, Leslie! I was thinking the baby would be on the counter wearing the recipe onesie (kidding! ), but a recipe card would be way more convenient...and sanitary! Haha!